So I’ve been working on some WordPress goodness for an unnamed multinational for some time and have been realizing that my own work has been rather embarrassing. I’m going back to a basic site, and trying to rebuild my site into something that can wow prospective money givers and not make me look like such a shlub. 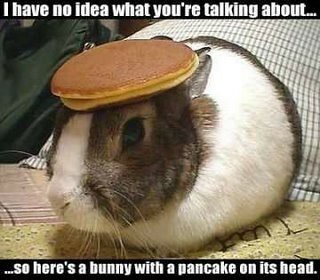 Until then, here’s a picture of a bunny with a pancake on it’s head, cuz I don’t know what I’m talking about.